It's Sunday morning. It's January. It's after most of the holiday hype has cooled off. So why aren't these snow bunnies skiing? Because January 6 was the first snowshoe race of the season at Beaver Creek Ski Resort. 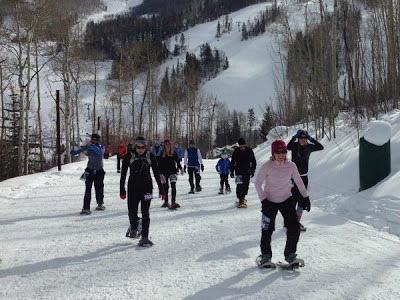 Each winter the Beaver Creek Running Series offers a snowshoe edition with races held on and around the mountain in January, February and March that draw pro and amateur racers. According to the race announcer, roughly 350 snowshoers took to today's 5K and 10K courses that wound up, down and around Beaver Creek's west side. These athletes make the race look easy. If you watched me on the trail, you'd probably think otherwise (I'm convinced I held up at least a dozen people when our course turned to slippery, downhill singletrack). But more on that tomorrow (and more pictures too)--I'm still warming up after standing around for too long this afternoon in wet socks and layers.